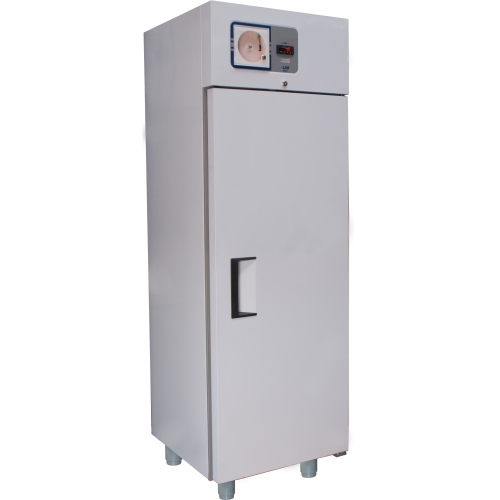 • Digital controller: with high and low temperature alarm, door open alarm, power failure alarm and logger on bord (records up to 32 events) • Solid door • Cooling unit: No. 1 located at the top of the structure. Structure: upright type, with stainless steel internal external non-toxic white plastic sheet. The corners of the cell are rounded for easy cleaning, the bottom is tray to contain spills. 600x600x1900 Dimensions - WxDxH 640x640x2050 size packaging - Automatic defrost - 3 wire shelves - lockable - R404a refrigerant • Insulation: 50 mm thick. • CFC-free refrigeration type: forced ventilation, to ensure uniformity and stability of temperature in different rooms - • Defrost: fully automatic, pre-programmed actions. The condensate is evaporated automatically.